Bridge column, February 7: Three can be seen, but what about four? Abraham Lincoln asked, "How many legs does a dog have if you call the tail a leg? "Four. Calling a tail a leg doesn't make it a leg." How many tricks do the defenders need to take to defeat South's contract of four spades? Right -- four. And just thinking about that number will often push one of the defenders toward the killing defense. In this deal, look at the North and East hands. West leads the heart three. What should East do after taking his ace? South made a weak jump overcall, showing a respectable six-card suit and 5 to 9 high-card points. 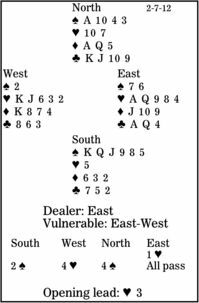 West, because it was a competitive auction, followed the Law of Total Tricks, jumping to the 10-trick level with a known 10-card fit. North, though, had enough to advance to four spades. Unwarned by the question, at the table many Easts would continue with a low heart, hoping partner would take the trick and shift to a club. Here, though, that is fatal. Declarer ruffs, draws trumps, and plays on clubs, getting two tricks established there to go with six spades and two diamonds. If West's four-heart bid is textbook, East should expect South to have a singleton heart. East can also see two club tricks, so his side needs to establish a diamond winner. And there isn't a moment to lose. East must shift immediately to the diamond jack. Declarer wins, takes two rounds of spades, and plays a club to dummy's nine. But East wins and leads another diamond. Then, when in with the club ace, the defenders cash that setting diamond trick.